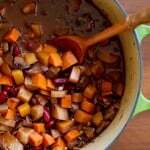 Butternut squash and root vegetable chili makes a hearty vegetarian meal perfect for the cold fall and winter months. The weather here in the Reno-Tahoe area made the quick transition from hot and sunny last week to windy and cloudy over the weekend. The leaves on the aspen trees have already begun turning color, there has been less daylight and cooler temperatures on my evening walks, pine needles are falling from the trees, and the general atmosphere seems quiet and relaxed. This can only mean one thing: fall is fastly approaching. Le sigh…autumn…I’m holding on to the last bits of warm summer weather with all my might, but I look forward to beautiful, peaceful fall. Plus, nothing beats a hot bowl of chili, a warm sweater, and a glass of red wine. One of my favorite parts about this time of year from a culinary standpoint is the abundance of available produce. Not only can we enjoy the last bits of vibrant summer fruits and veggies, but the hearty, carby, comfy fall squash are making their way into the produce section as well. Although the warm weather still calls for crisp and refreshing meals, I can’t help but pick up butternut and kabocha squash, along with heaps and heaps of sweet potatoes to put together carbolicious warmly-spiced meals. 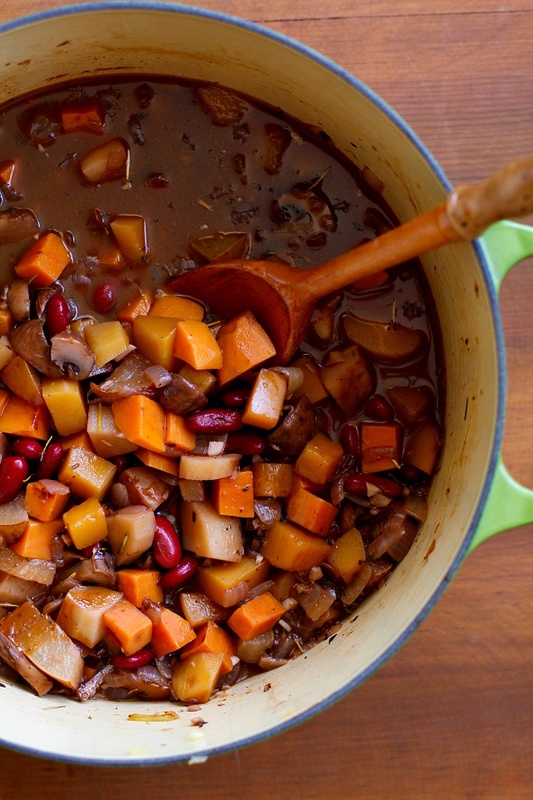 Which brings me to my next point: This chili, locked and loaded with comforting vegetables like parsnips, sweet potato, butternut squash, and mushrooms (and even a pear! ), is a cozy meal for those chilly evenings this time of year. I added full-bodied red wine, as well as a touch of cinnamon and ground cocoa powder to add richness to the satisfying dish. Sound strange does it? You’ll just have to taste it to believe it! Generally, I love cooking with wine as well as sipping on the wine I cook with during the preparation process…and of course when I sit down to enjoy the fruits of my labor, I indulge in a heavy pour. When all’s said and done, the house smells magnificent and my belly and heart are full of satisfaction from the relaxing meal. With football season right around the corner, I’m envisioning this chili as the perfect healthy tailgating food. It’s super shareable, nice and filling, and will prevent your friends from becoming pantry pirates when they get hungry in the middle of the game. Simply whip up a batch of your favorite homemade cornbread, and you’ve got yourself the whole nine yards (<- get it? Nine yards? Football jokes? I try). You can replace the kidney beans with pinto beans, black beans or chickpeas, and/or substitute the sweet potato and parsnip for regular potato and carrot. ALSO: why not try acorn squash or kabocha squash instead of (or in addition to) the butternut squash? Finally, if you aren’t trying to make this a vegan meal, you can use chicken broth instead of vegetable broth. Point is: you can make this delicious stew your own. Just be sure to add the wine! 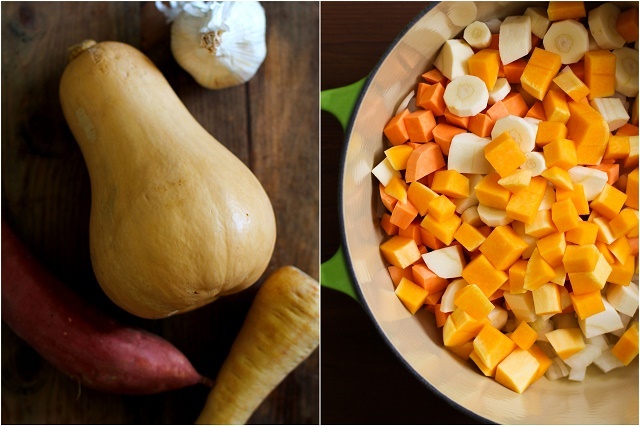 Add the olive oil, onion, sweet potato, parsnip, butternut squash to a large pot or Dutch oven and heat to medium-high. Cook for 8 minutes, stirring occasionally. Add mushrooms, garlic, pear, chili powder, cocoa powder, cinnamon, herbs de Provence, salt, and saute 3 minutes, stirring occasionally. Add the kidney beans, wine and vegetable broth and bring to a full boil. Reduce the heat, cover, and simmer 10 to 20 minutes, or until vegetables are soft. This is the most stunning and fancy chili <3 I am in love with this! I'm not big on soup, but hearty chilis are always welcome! Can’t wait to try this recipe out–sounds delicious! What a gorgeous chili! You’ve really captured all the flavors of fall! This makes me so excited for fall and all of the delicious squash! I love the idea of adding red wine and cocoa to chili. It sounds so warm and inviting! Cheers to that! This is definitely the best of times for produce! You can have your corn and your butternut squash too! And I totally love that. We had some cool days recently and I could have totally used a solid dose of this chili! A pear. And wine. And cocoa powder. Could this recipe be any more fantabulous?! Multiple glasses of vino on the side, please. Mmmm, mmm give me all them veggie carbs! When I went for my morning walk today, I was so shocked by how crisp the air felt! I’m still hanging on to the last minutes of summer, but I’m also getting a teeeensie bit excited by the prospect of colder weather. Love that cab flavor you got going in this chili! I was juuuuuust in Lodi two weekends ago, but I didn’t get a chance to try Noble’s wines. Next time, for sure! I haven’t quite accepted fall yet, but I would definitely accept this chili. So many unique flavors! Our weather has just turned here too, and I’ll have to say I’m half torn between tomato season and yet looking forward to all things root veggies! This looks like the perfect cozy meal for the rainy days we have coming! Stunning! I mean, seriously gorgeous, considering it’s chili! I love the idea of using pears in this dish, too. I’ve used the cocoa and root veggies in my chili before (and the wine!) but never pears. A new to-do for cooler days ahead. Thank you!